And in the two years since the data behind that image was gathered, the Event Horizon Telescope partnership behind the groundbreaking observations has already expanded, with more telescopes looking to join the fray soon. Each new instrument will sharpen scientists' images of their quarry, but each will also need to be outfitted carefully before it can join the collaboration. Fortunately, the hardest work is already done, Dan Marrone, an astronomer at the University of Arizona and a member of the Event Horizon Telescope science team, told Space.com. "For the most part, the sites we're adding now are just reimplementing the basic hardware that we know how to do well," he said. But the more telescopes the team can bring on board, the sharper the final image is. The challenge in doing this comes from the fact that none of these telescopes were custom-built for the Event Horizon Telescope project. They're just instruments that happen to be what scientists call submillimeter telescopes, which can sense the wavelength range the Event Horizon team members needed to tune to for their black hole hunt. Then, each of the instruments needed to be armed with an atomic clock so precise that it loses just 1 second every 100 million years. The clock's time must be imprinted on all the telescope's observations so that when scientists combine data gathered by different telescopes, the observations aren't blurred. The Event Horizon Telescope team has already outfitted one newcomer this way: the Greenland Telescope, which came online for the program's 2018 observation campaign. 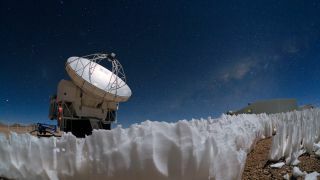 The addition posed its own challenges: The telescope was originally built as a prototype for the dishes of ALMA, then outfitted to withstand the cold, shipped up to Greenland and set up as part of the Event Horizon Telescope. That addition improved the team's observations of the northern part of M87, stretching the array's coverage northward. Another upcoming addition, of the Kitt Peak Telescope in Arizona, will strengthen the array in the opposite way, partnering with the nearby Submillimeter Telescope to offer scientists some redundancy, helping the team calibrate the observations. "If we could choose our array, we would have two telescopes at every site," Marrone said. While there are plenty of schemas for how to arrange a collection of networked instruments, the team isn't really all that picky — more telescopes will always help their resolution, no matter where they are. "The Earth's terrain does a good job of randomizing where we can put them," Marrone said. But there's no reason the Event Horizon Telescope will always need to be Earth-bound. Currently, there are no submillimeter telescopes in orbit, but some team members are looking into proposing just such an instrument. "You don't need that much of a telescope," Marrone said. "It's not quite cubesat scale, but it ain't JWST," he added, referencing the massive, over-budget and behind-schedule James Webb Space Telescope currently scheduled to launch in 2021. And perhaps a space-based contributor would address some of the mundane challenges that haunt Marrone and his colleagues during their quest to see what can't be seen. That's because the process requires gathering data, multiplying it thousands of times, and then clarifying a perfect sine wave, rhythmic and symmetrical, from it. "The number of days I've spent just trying to figure out what was making my sine wave wiggle, it can be really painful," Marrone said. The culprits can range from someone stepping on a cable or jumping near an atomic clock, to the wind blowing too strongly or two pieces of metal touching each other when they shouldn't. "Doing this is a really weird job," Marrone said. "It's all these stupid little issues that we always have to sort out to get this to work." But when it works, it's worth it.